This is it. This is the meal that turned me around on Smashburger. You see, the topic of best burgers in Vegas is a hot one, and I am regularly asked/required/tortured to eat/write/compare burgers until I can't take it anymore. So like everybody else, I am something of a Vegas burger expert. And also like everybody else, I have my favorites. Fukuburger is one. In-N-Out always will be up there. There are others. But lately, Smashburger has been around the top of the list, too. Now it's sliding down, as if it slipped on a buttery, greasy chute to mediocrity. The burgers are very good. The smash-it-on-the-flat-top-grill method is solid, and the toppings are fresh and high quality. But the thing is greasy ... too greasy. A real burger shouldn't be without some dripping fatjuice, but Smashburgers go a little too far. 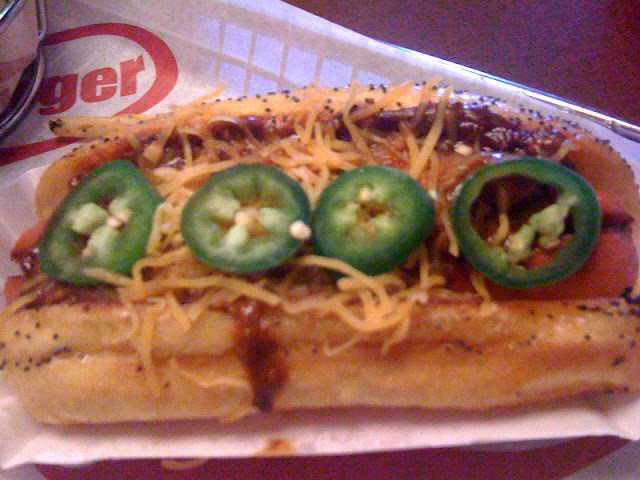 And I realized that when, after having almost every burger on the menu, I tried this dog. It's a perfectly decent, all-beef weiner, topped with beefy chili, grated cheese, onions and pretty jalapeno slices. But they rock the smash method on dogs, too, splitting this sucker open and smushing it flat. With burgers, it creates juicyness. With dogs, it dries 'em out. So it's shiny and greasy on the outside and flaky and super-salty on the inside. Mediocrity. Further oiling things up is the fact that they butter toasted the poppy seed bun. So now you've got greasy dog, greasy chili and greasy bread creating a yucktacular film in your mouth, which is melting, by the way, from these fresh 'penos. A bit much? Yes. I still like you, Smashburger. I will still eat you. Just not as much.